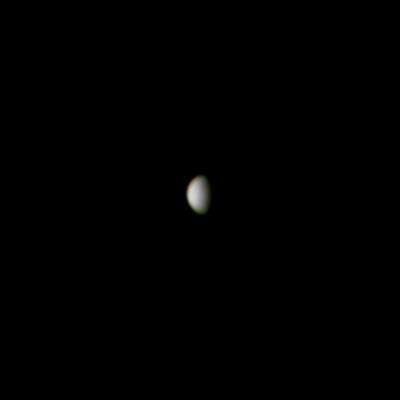 I finally had the time to try to shoot the planet Venus for the first time. It was the 22 November 2016. The situation of the planet wasn’t very good to capture it as it was very low in altitude and there was many building that can hide it. At 16° of elevation the turbulence was high and as a consequence i wasn’t able to use my Barlow x3 for a maximum magnification. On the other hand i used the Barlow x2 and that way the effect of the turbulence was minimized. For softwares i used Sharpcap to capture the videos of the planet and Autostakkert! 2 and Registax for processing. I managed to capture many videos at several times and the best one was that i shot at 17h53. The turbulence wasn’t very high and the planet was stable. The video contains 5000 frames at 25 frame / second. The above image is a zoom at 150% of the original version. Of course there is any details of the planet visible. Venus has alot of clouds in it’s atmosphere that hide it’s surface.